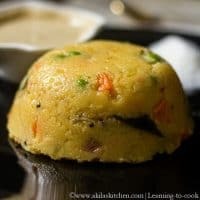 Rava Kichadi is an easy South Indian breakfast recipe in which rava is fried and cooked with vegetables and adding a dash of ghee gives a nice aroma to this recipe. It is mainly taken as a breakfast but also can be taken for dinner. A simple chutney can go well this this rava kichadi. 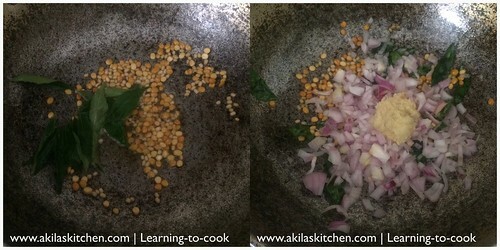 Rava Kichadi recipe with step by step instructions and a video for your easy understanding and leanring. 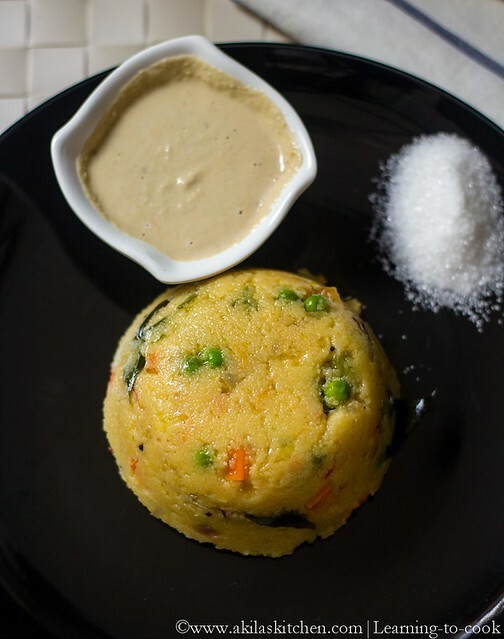 Rava Kichadi is one of my favorite breakfast recipe. I love to have it more when it is hot hot. I can eat it simply without any side dish also, but it tastes great with any spicy tomato chutney or simple coconut chutney. If you like you can add spices also. Since my hubby does not like spices in this kichadi, i avoided them. 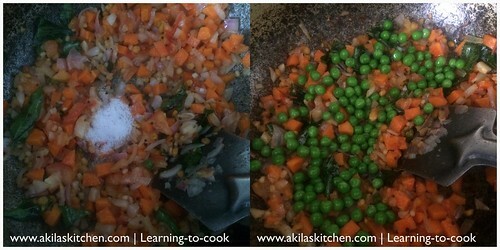 Also I added some veggies like carrot and green peas to give good taste. 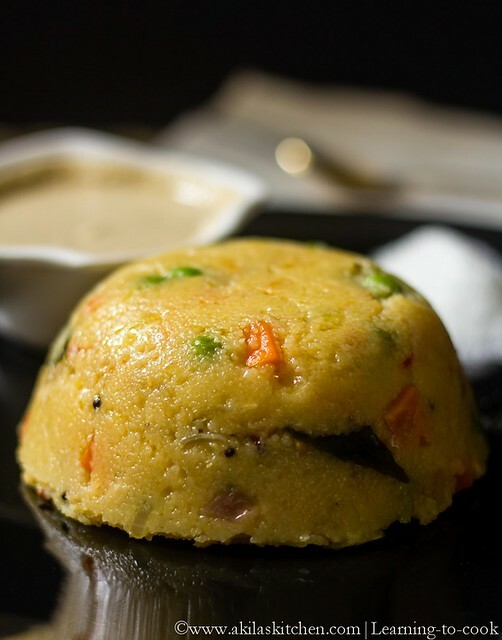 Lets see how to prepare this easy Rava Kichadi Recipe. Here are some yummy breakfasts for you to view. 1. In a Kadai or pan, add few drops of ghee. Dry roast the Rava. Do not over roast them. Keep it aside. 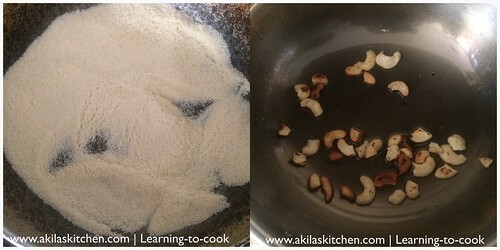 Now in the same pan, add a tsp of ghee and fry the cashews till light brown colour. Keep aside. 3. When the onion turns translucent, add the tomato. Saute it nicely. Add the chopped carrots. Cook it, sprinkling little water. 4. 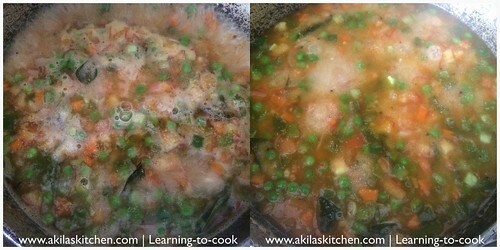 Add the required salt and add in the green peas. (I used frozen green peas). 5. Add the water now and allow to boil. Add the turmeric powder. 6. 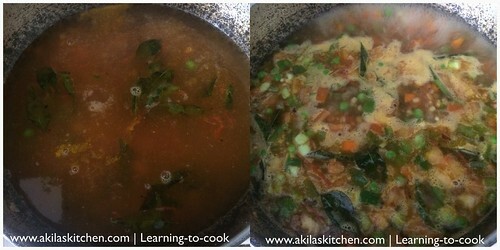 While it is boiling, add the roasted rava, little by little and keep on stirring to avoid the formation of lumps. (While doing this, keep the flame in low to medium). 7. Finally add the cashews and the remaining ghee and give a stir. (Cashews can be added along with the carrot also, but our family likes the crunchy taste of cashews, so added it finally). 8. Serve the hot kichadi with any of your favorite chutney. 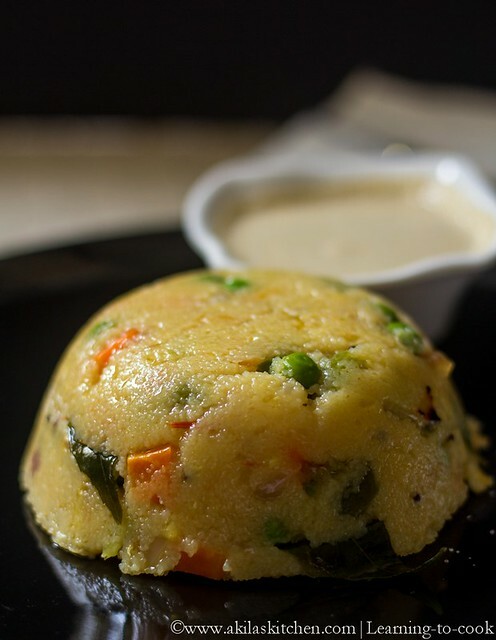 We had it with Potukadalai chutney. 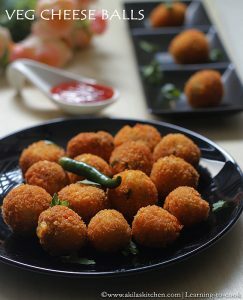 Yummy and easy Rava Kichadi is Ready. In a Kadai or pan, add few drops of ghee. Dry roast the Rava. Do not over roast them. Keep it aside. 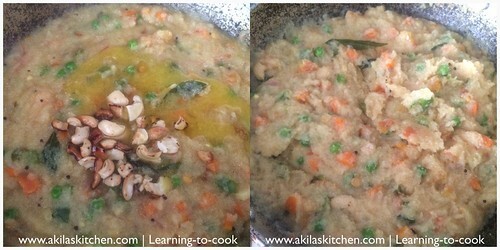 Now in the same pan, add a tsp of ghee and fry the cashews till light brown colour. Keep aside. When the onion turns translucent, add the tomato. Saute it nicely. Add the chopped carrots. Cook it, sprinkling little water. Add the required salt and add in the green peas. (I used frozen green peas). Add the water now and allow to boil. Add the turmeric powder. 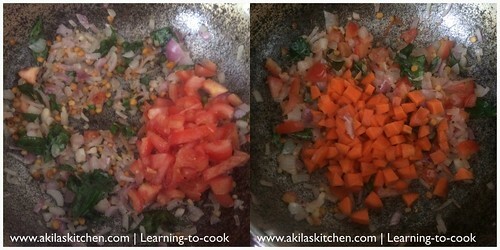 While it is boiling, add the roasted rava, little by little and keep on stirring to avoid the formation of lumps. (While doing this, keep the flame in low to medium). Finally add the cashews and the remaining ghee and give a stir. (Cashews can be added along with the carrot also, but our family likes the crunchy taste of cashews, so added it finally). *post first published on August 29th 2015. Updated with recipe. This has to my hub's fav. Super nice.